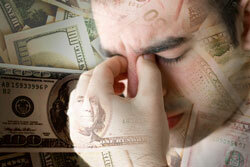 You have probably just finished paying your FY2016/2Q real estate tax bill which was due earlier this week. 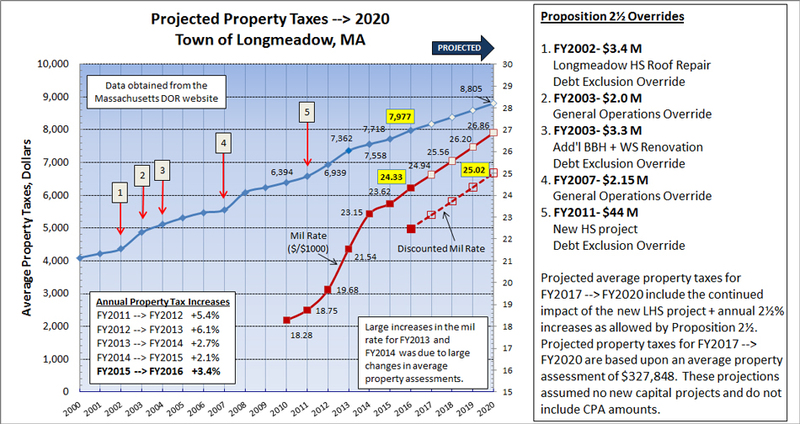 It is interesting to look at Longmeadow property taxes since 2000 and project what level they may reach in 2020. Emerging budget issues include funding of "free" (or reduced) tuition" for all day kindergarten as well as three major capital projects (new DPW facility, renovated or new Senior Center and new middle schools). There is also a looming financial crisis related to taxation limits by Proposition 2½ that may occur as soon as FY2020. 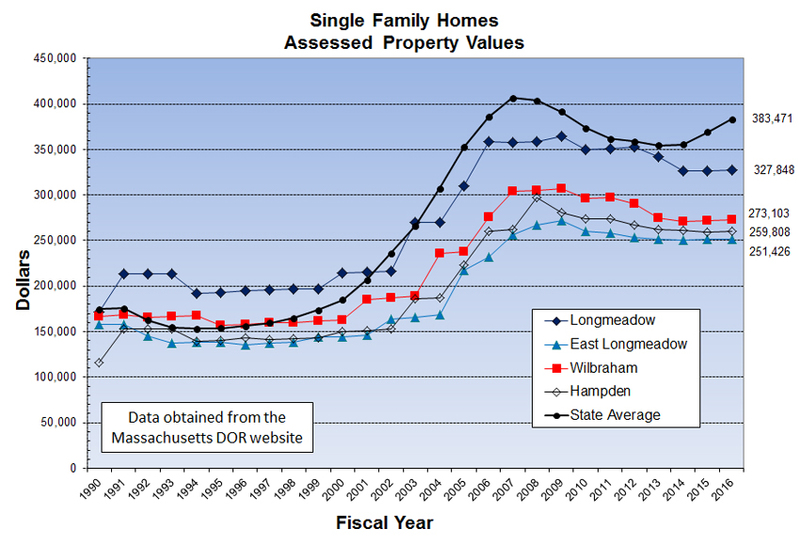 Therefore, it is useful to consider their impact on future Longmeadow property taxes. In this first LongmeadowBuzz post- Longmeadow Property Taxes- Part I, the discussion will be limited and not include the impact of the three large capital projects under consideration. In Parts II and III, the impact of each of these major capital projects will incrementally be added to the base case. In Figure 1 below there is a chart of Longmeadow property taxes since 2000 which have increased at an average annual rate of 4.2%. This annual change is significantly higher than the average annual change in CPI over this same time period (+2.2%/year). Proposition 2½ limits annual property tax increases to ~ 2.5% but five different Proposition 2½ overrides (see table in the right side of chart in Figure 1 below) are the primary reasons for the average increase to exceed that limit. 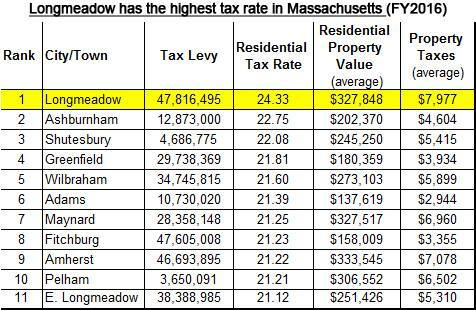 The mean or average Longmeadow tax bill in FY2016 is $7977 (corresponding to a mean property value of $327,848). 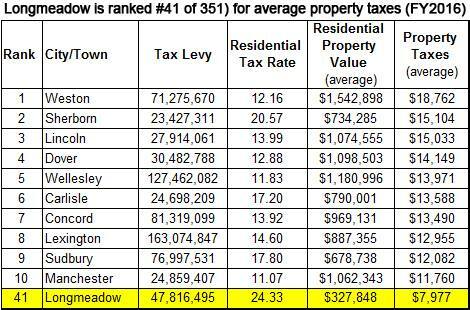 This mean (or average) tax bill is a bit misleading because of the wide range of property values in Longmeadow. The range of Longmeadow single family FY2016 property tax bills for almost 5500 properties is from $3100 to $42,800. A more useful statistic is the median (50% are lower, 50% are higher) tax bill. With a FY2016 median property value of $285,100 (x $24.33/$1000), the FY2016 median tax bill is $6936. Recently, local media reported that Longmeadow is ranked #1 with the highest TAX RATE (mil rate) in the state (see Table I below). All of the towns ranked in the top 10 with the exception of Ashburnham are located in the central/ western part of our state. East Longmeadow is ranked #11. 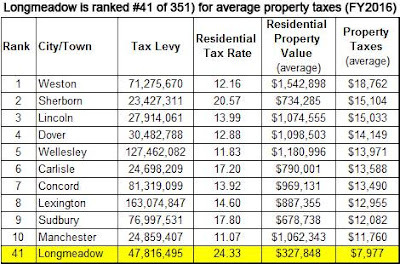 However, PROPERTY TAXES (FY2016) in Longmeadow are ranked #41 out of 351 cities and towns in Massachusetts (see Table II below). Not surprising...all of the cities and towns with higher taxes are located in the eastern part of our state. Are there any issues related to Longmeadow's high tax rate? Proposition 2½ was passed into law in 1980. It imposes a levy limit which is usually ~ 2.5% maximum increase in property taxes per year with unused amounts that can be "banked" and used in subsequent years. There is also another important aspect of this Proposition 2½ law that may affect Longmeadow property taxes in FY2020. It involves the levy ceiling which provides that the maximum amount of property taxes that can be charged to property owners in a given year is 2.5% of the total property value or a maximum mil rate of $25/$1000 of property value. Debt exclusion overrides for major capital projects such as Longmeadow High School are not counted in this levy ceiling. 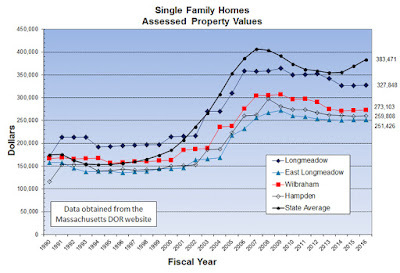 Assessed property values for Longmeadow vs. the surrounding communities have shown a flat to lower average assessed value for the past 10 years (see Figure 2 below). Average state assessed values have increased somewhat in the past two years. With flat to lower assessed property values, the levy ceiling will be reached faster than if the assessed property values were increasing each year. In Figure 1 there is a line entitled "discounted mil rate" (does not included debt excluded overrrides) which is this levy ceiling. 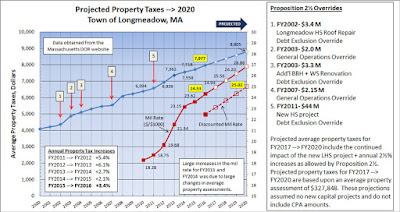 If property values remain stable and there are no Proposition 2½ Operational Overrides (these increases are not discounted), Longmeadow will likely reach the maximum $25/$1000 mil rate in FY2020 and we will no longer be able to increase taxes. At that time without increases in assessed property values or a change in Mass General Law, Longmeadow will need to make major changes in how we meet our town budget revenue needs including charging fees for various services including trash collection, etc. In addition, in order to meet a balanced budget and contractual salary increases, town/ school staff and/or services will likely need to be cut drastically. Our Select Board should engage in discussions with Rep. Brian Ashe and Senator Eric Lesser to see if this levy ceiling restriction in the Proposition 2½ law can be increased or eliminated to help Longmeadow (and other communities with high mil rates) avoid the potential budget crisis that we will be facing in FY2020. Reaching this levy ceiling will not be a pretty scenario for our town!